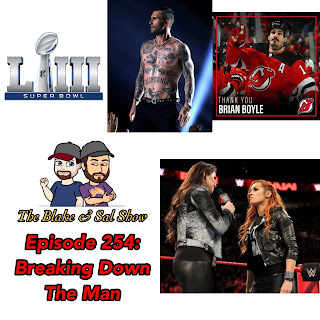 With Mark still out sick, the guys discuss the breaking news of the New Jersey Devils trading Brian Boyle, predict who is going to win Celebrity Big Brother and how Rent Live has effected NBC's plans for Hair Live. 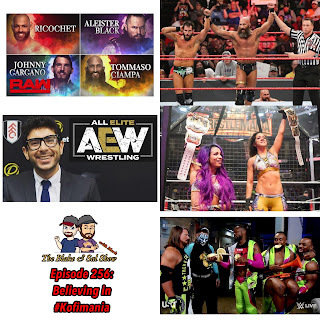 Then they break down all the Super Bowl festivities from the lackluster game, the best and worst commercials, the weirdness of the halftime show and NXT Halftime Heat. 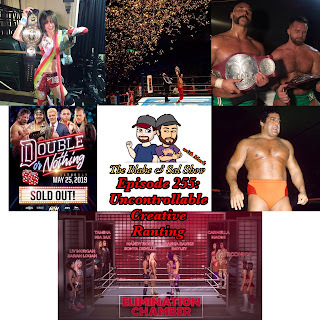 Finally after going through a slow wrestling news week, they break down this week in Becky Lynch as she has in ring segments with both Stephanie McMahon and Triple H and where we think the storyline is going. Blake and Sal go without Mark this week as they have survived fire and a deep freeze. 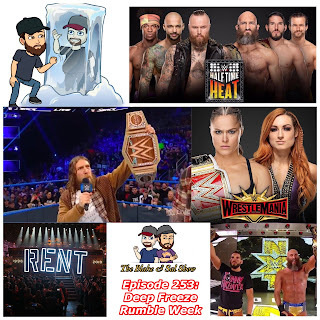 After a quick look at Celebrity Big Brother, the Super Bowl and a big cross promoted segment discussing RENT Live, the guys look at a crazy week in WWE, including news about Ronda Rousey, Dean Ambrose and KENTA, Halftime Heat, Becky Lynch being the biggest star in the company and looking at a very strange episode of Smackdown. Sit back, try to keep warm, and enjoy the show!